Kore Patented WOBBLE Chair - Does it actually work? Home Kids	Kore Patented WOBBLE Chair – Is it really good for your kid? Kore Patented WOBBLE Chair – Is it really good for your kid? Keeping our kids from running around is a hard task. As parents, we are always worried about their restlessness. But what if we could get them to sit down and enjoy doing that? It would really be something. That is exactly what the Kore wobble chair does. A normal seat will become a playground for your child. These chairs are unlike regular chairs. They have the unique ability to conform your children’s bodies to a natural posture. It is an innovative chair that makes it easy for your kid’s knees, hips, and back to find comfort with unlimited sitting positions. They will have extra energy while doing everyday stuff like homework, drawing, eating, and playing video games. Each child has his/her own specific taste, which is why the Kore wobble chairs come in different colors. It is also designed to be great for children with ADD or ADHD. The chair has also been known to increase secondary focus, thus promoting better learning for kids and increasing their attention to details. The chairs rock and spin gently on its doomed designed base. This allows active sitting and in the process exercising the back. Your kids can have a better sitting experience and enjoy the health effects such as a healthier back and muscles. 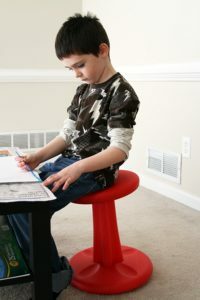 The Kore wobble chair was designed with the exercise ball in mind even though in this case, it is for kids. This makes activities such as homework, eating and playing video games more like exercise and not just sedentary. They are regarded as patented chairs due to the fact that the curvature of their base is. The chairs also have warning ring around the bottom of the base which is also patented. The product designs are patented and the functionality is patented too. These patented features make this chair unique. This is one of the most important features of this chair. Kids having fun whilst doing their everyday activities is one of the most important aspects of growing up. Using normal chairs, activities such as homework, drawing, eating and playing video/board games are sedentary and boring sometimes. That is not the case with Kore Wobble chairs. They make the activities more fun and a form of exercise. These chairs are all designed to meet or exceed all child safety requirements. This requirement covers every state in the country. Thus, there is no chance that your kid will tip over whilst sitting in that chair. For kids with attention deficit hyperactivity disorder (ADHD or ADD), these chairs are more than just a furniture. 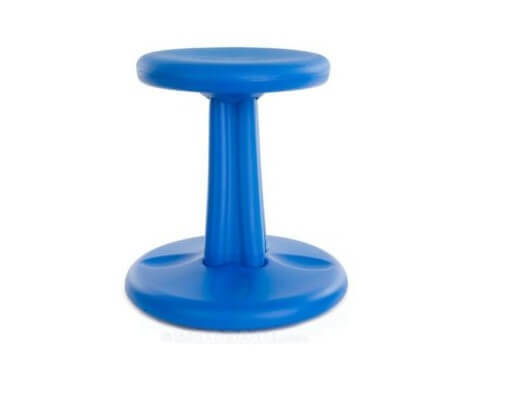 When kids wobble aggressively on the Kore chair, an increased blood flow to their brain occurs and this, in turn, silences the requirements for fidgety kids to move. The kids will be able to learn better after that and become even more productive. Unteachable kids are now finding it easier to learn. They come in several colors such as Dark Blue, Grey, Blue, Red, Green, Purple, Black, Yellow, and White. Thus making it easier for your kid to pick one that is a good fit for his/her room. The chairs aren’t meant for kids only. They come in different categories. Teenagers or adults can also use them as they have a weight limit of 275 lb. Gently rounded ergonomic base: This makes it easier for you to move and flex without leaving your seat. Provides both stability and flexibility: This is very useful as children can be seated for a long time while carrying out their activities. The stability and flexibility make it more comfortable for them. Exercises back, leg and abdominal area: Kids can sit, wiggle, and fidget while using these chairs, in the process exercising parts of their body like the back, leg, and abdominal area. They relieve sore muscles and stiff joints. Kore chairs allow a wide range of movement: This movement can either be at large desk or work areas. Absolute fun to use: usual sedentary activities like homework, drawing, eating and playing video/board games will become more fun for the kids. They will actually be looking forward to those activities due to the features of Kore wobble chairs. Safe: All the safety measures are met, thus they are perfectly safe for your kids. They are excellent for classrooms. Perfect for kids with ADD or ADHD: Their restlessness can be channeled into something productive, easing their learning process. Weight limit of 250: They aren’t designed for kids only, teenagers can also use it and will benefit from using them. Manufactured in the U.S.A, with all the parts patented. It does not work too well on non-carpeted floor due to the way the bottom is plastic and not made of any type of rubberized material. Durability issues: The chairs can crack in after using them for less than 2 years. The plastics used aren’t up to the required standard. They lack grips: The absence of grips at the top or bottom makes them slippery. The chairs are small for children of certain age and this makes them uncomfortable. 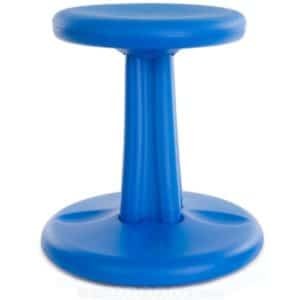 The stool top may separate from the post when kids lean back. It is not soft to sit on: This is why some kids do not find it comfortable. The Kore wobble chair is quite unique. It has several features that make it perfect for kids. Their everyday activities will no longer become sedentary and their productivity will likely be increased over time. The exercise that kids though while seated on these chairs is very important and its safety is something that makes parents feel relaxed about them. However, they also have flaws such as their exorbitant price. If you are looking to find something more affordable, maybe a bean bag chair could be a solution. Another disadvante is that they are short for kids of a certain age and aren’t durable due to the plastics used in manufacturing them. They are slippery as they lack grips and do not work on certain floors. Before purchasing this item, ensure that you know its features, pros, and cons. This will make it easier for you to make a decision. Need a high chair for your kids? Check out this guide on how to find the right fit!